I think this book might be perfect. ‘What is it like to have to leave everything behind and travel many miles to somewhere unfamiliar and strange? A mother and her two children set out on such a journey; one filled with fear of the unknown, but also great hope. I have been using social media to post about politics a lot lately. I think it’s important to share; to raise awareness and do our bit. Signing a petition, sharing a meme, just talking about this stuff, might feel like a drop in the ocean but it all adds together to make a wave. Another thing you can do is talk to your kids. Share books with them. Watch CBBC’s newsround together. Answer their questions. Because, as Whitney said, they are our future, and helping them to understand, and to get it – to grow up to be empathetic and kind – could be what fixes everything. This book is…everything. 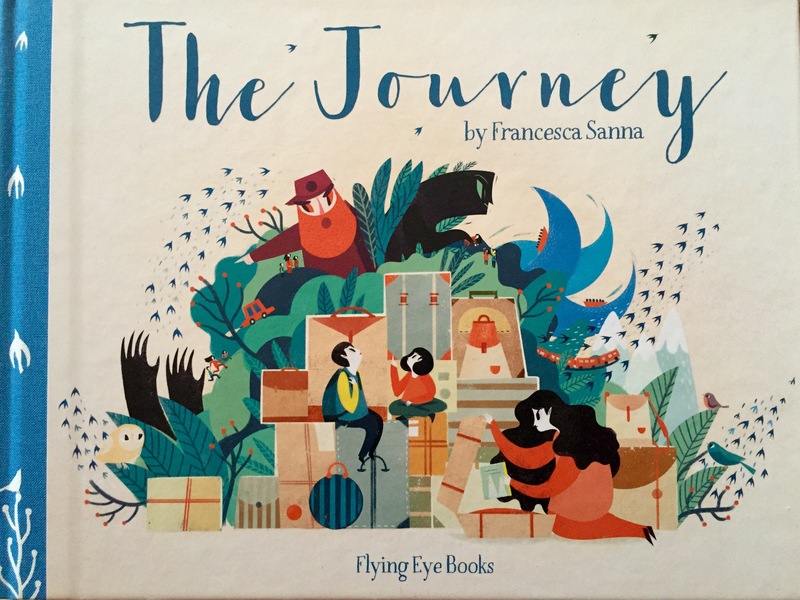 So beautifully done, it tells the stories of migration in a brilliantly child friendly way. It links their migration with nature and shows their hopes and fears through the stories they tell each other. All things that will help you talk your kids through this book, through newsround, and hopefully, then, to the new kids in their classes and into a future that is less bomby and bordery and more inclusive and smiley. Look at how the left page is brighter and full of colours and nature. The right page is darker and some of the natural elements are replaced with threatening hand shadows and eyes. Younger children will be able to take the text as they hear it but older children will find so much here to think about and question. You can order your copy from Indy-bookshop-friendly, tax-paying Hive.co.uk here.